Bloodhound, the first software of its kind empowers traders with the ability to model, test, analyze and execute trading systems rapidly. Bloodhound will let you take your knowledge of trading and allow you to put it into practice using the most efficient way possible. With Bloodhound you can determine how profitable your system is before risking real capital using simple visual programming. Whether you are learning on your own or with a mentor, it is imperative as a trader to back-test or make improvements to any trade system. Skipping this crucial step in the system development process puts you at a serious disadvantage. Until now, the only way to properly back-test a trade strategy was to manually code it in some scripting or programming language, which is a very tall order for traders who aren’t software developers. Bloodhound gives you the power to discover great trading systems like never before, all without the need to code it yourself. An auto-trading robot can trade without the emotional baggage that a human trader has. With the high percentage of overall trades in the market being executed by autotraded systems today; it’s practically a necessity to have some sort of robotic assistance to remain competitive. Bloodhound gives you the power to execute your trade system without breaking a sweat. With Bloodhound you can sit back and play the role of a monitor, while it automatically executes orders on your behalf - all according to your trade system. 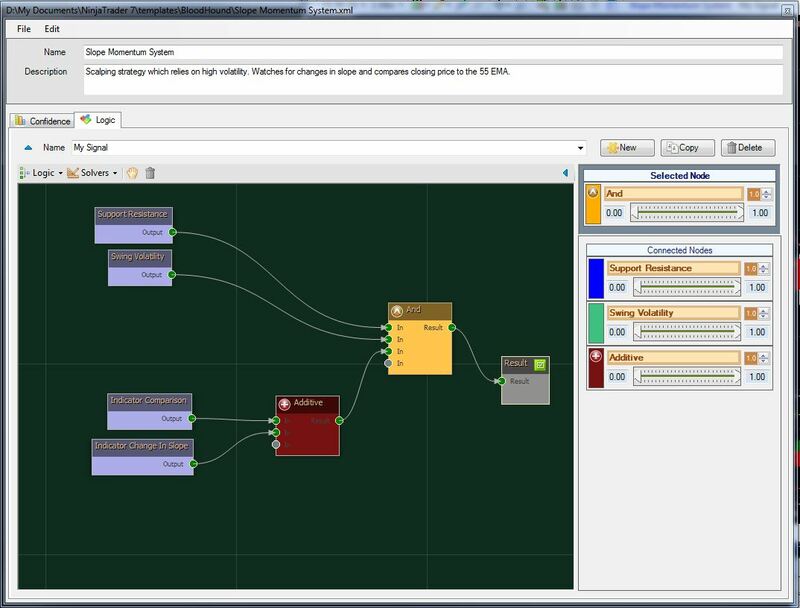 The core feature of Bloodhound is a unique visual programming UI. Using sophisticated logic and function nodes, you can create trade systems of arbitrary complexity using only your mouse. Bloodhound is also amazingly fast, enabling you to prototype, test and analyze trading systems faster than any professional software developer can. Changes to your system are reflected in real-time. This instantaneous feedback boosts creativity and experimentation giving you the ability to hone your system to perfection without the tedium of the software development process. Read data from custom indicators and charts, downloaded from 3rd party sources or developed by you. Bloodhound is also a full blown auto-trading robot out of the box. Specify your entry and exits conditions using Bloodhound’s powerful logic capabilities, then execute your actual trades using Raven (included with Bloodhound). One of the key advantages that robotic execution has over manual execution is the complete lack of emotion when placing trades. Trading is a game of probabilities, and only when you actually execute your system properly can you realize favorable odds. Auto-traders are also very accurate. An auto-trader won't miss opportunities or make errant trades that don't actually meet your criteria. All SharkIndicators partners have been rigorously trained by us and use our software to trade and teach on a daily basis. In addition to the instruction received by your trading coach, SharkIndicators provides a library of videos, documentation, support forums and interactive workshops all included with your license of Bloodhound. We hand hold you through the development, analysis and execution of your trading systems allowing you to reach your trading goals with our software. To get started head over to our getting started guide which will direct you to all the important resources on our site. Put the odds in your favor today - visit us at our main website: www.sharkindicators.com to learn more!